If you're thinking about adopting a dog, you need to find the right breed that fits your lifestyle. Details like size, energy level, and personality can really affect not only your home but the happiness of your new furry friend. Doing your due diligence and researching is a great way to start off the adoption process! If you have the right kind of life for a cheerful, smart, and endlessly energetic dog, then you might want to consider the Kooikerhondje. The Kooikerhondje, pronounced OY-KER-HOUND-YEH, is a medium-sized dog with an adult male and female weighing 20–24 lbs pounds, according to the American Kennel Club. Kooikerhondjes can be up to 16 inches tall. Life expectancy of the Kooikerhondje is 12-14 years. The origins of the Kooikerhondje, aka the Dutch decoy dog, can be found as far back as the 1500's. Some say that the Kooikerhondje was owned by a man who claims the dog saved his life by warning him of the Spanish attack. It is believed that this dog originated from the spaniel. By the 1930's this lovely breed was nearly extinct. Through the devotion of M.C.S. Baroness van Hardenbroek, the breed was rediscovered. She began her breeding program in 1939. This breed is in the company of the German Shepherd, Siberian Husky, and the Akita in the Working Dog Group. The Kooiker can be a dog with two personalities with both their sensitivity and their dominant side coming into play. The two-sided temperament of the Kooiker makes them highly fascinating and interesting to be around, but the training can be a small challenge. The owner needs to have lots of love and patience to get to know the individual personality of the puppy and young dog. The Kooikerhondje is a very versatile dog. They are a working dog, a watchdog, a companion dog, and also a hunting dog. They also tend to be very close and clingy around their family. They want to work with their handler and will listen because of their love for their family as well as their innate obedience. The Kooikerhondje is a medium-sized dog, just slightly longer than tall, resembling a small setter or spaniel, according to the United Kennel Club. Their ears are high set and their coat is of medium length and slightly wavy, white in color with bright orange to deep red patches. The tail is predominantly white and well feathered. Interested in other breeds? 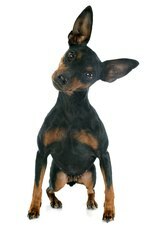 Check out this article about German Rottweilers and this list of different doodle dogs.